When you meet Doug Tomlinson, you immediately feel his passion for his job. His vision is for a safe, reliable, and efficient transportation network. It sounds simple enough, until he explains what it will take to get us there. Getting everyone, from PennDOT employees to Pennsylvania motorists, to understand his vision will be challenging since the ideas are more abstract and less tangible than traditional concepts of roads and bridges. When Tomlinson describes traffic operations and highway safety, he describes topics like traffic congestion, performance data, and crash statistics. He talks about the new age of technology where information is expected to be real-time and on-demand at your fingertips. These technological marvels offer great opportunities, but bring with them distracted driving as they compete for a driver's attention taking away their focus from the task at hand. Tomlinson began his career with PennDOT in 1994. Over the years, he's focused on a wide-range range of topics including work zones, traffic signals, traffic calming, incident management, Intelligent Transportation Systems (ITS), and Transportation Systems Management and Operations (TSMO). Each subject has worked to broaden his knowledge and understanding of the traffic challenges we face every day. He talks about these subjects as if he has been training for a marathon. On December 1, 2018, the starter gun went off as he began his new role as the chief of the Highway Safety and Traffic Operations (HSTO) Division within the Bureau of Maintenance and Operations. 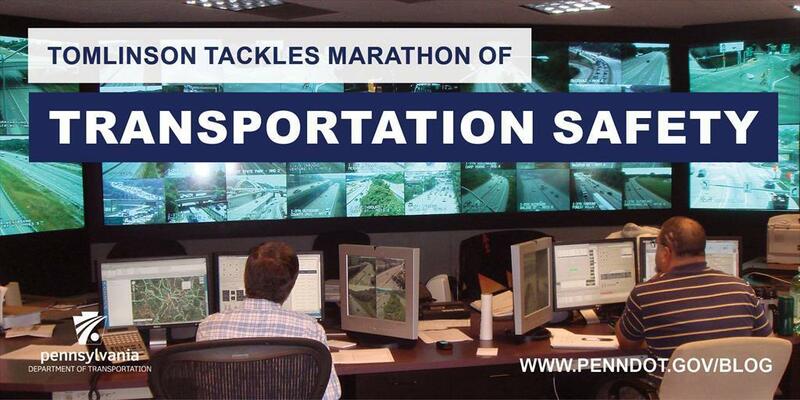 His marathon includes working to reduce fatalities and serious crashes, while striving for a less congested road network. Along the way, he's thinking about rumble strips that will warn drivers of erratic behavior, message signs that can help motorists make informed travel decisions, and pavement markings that will keep people traveling on the correct path. For Tomlinson, his greatest accomplishment to date has been his running of the Boston Marathon in 2018 under very challenging weather conditions. His vision and determination for HSTO will be an even greater challenge, but his training and determination will surely lead us along a successful path to the finish line.